It started with the humble bread roll: twenty five years ago the company Kern & Sammet GmbH was founded in Mansfeld; its production got off the ground in 1993 with 15 employees. Plant II opened in Eisleben in 1997, and when Klemme AG got on board this was followed by further ground breaking ceremonies, new foundation stones and start-ups. As the investor, the Swiss company ARYZTA AG, with a globally leading position in the field of speciality baked foods, has continued the success story. At the moment, in the shape of plant VII at the Eisleben location, one of the most modern bakeries in the world is now under construction. 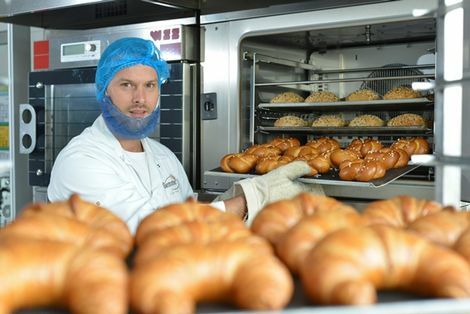 ARYZTA currently employs 1,550 men and women at the large-scale Klemme bakeries in Saxony-Anhalt, making it one of the leading businesses in the food industry in the federal state. Every month, around 10,000 tonnes of flour and 700 tonnes of butter are processed at the plants in Eisleben and Mansfeld. The short transport routes for the key raw material of flour in a region that has a robust agricultural sector was one of the main reasons for the choice of location. More than 120 trucks loaded with frozen baked foods call at the plant storage facility every day. All in all, 60 percent are for customers in Germany, while 40 percent of the products are exported, mainly to European countries, the USA, Japan and Australia. "We want to be the clear leaders when it comes to quality," says Frank Kleiner from the European Management team of ARYZTA AG. When the market for East German products collapsed 25 years ago, most of the companies in the food industry in Saxony-Anhalt found themselves baking the humble bread roll. By the mid 1990s the situation had stabilised, however, explains Dr. Michael Heinemann, Chairman of the Advisory Council of the South Saxony-Anhalt Network for the Food Industry, and Managing Partner of the company WHG Weißenfelser Handels-Gesellschaft, which was established in 1991. "The companies restructured their production, invested strongly in their operational sites as well as their technology, products, packaging and quality assurance, and developed new marketing strategies," explains Heinemann. Some of the traditional eastern brands managed to survive. "We succeeded in bringing high quality products and quality which has received many accolades onto the market." The companies have now established themselves firmly in the former east of Germany and have the potential to grow in the west. Participating in the network has contributed to bringing the research potential together and gaining support for education and training at the political level, while the cooperation with decision makers has supported the development of the framework conditions and the infrastructure. In the field of manufacturing, the production of feed- and foodstuffs has been one of the leading sectors in Saxony-Anhalt for many years. In the first half of 2015, 103 companies with more than 50 employees generated a total turnover of 2.9 billion Euros, of which 542 million Euros (18.5 percent) were earned abroad. Since 2002, the proportion earned abroad has doubled. With shared marketing campaigns, such as the new products shelf for products testing in supermarkets, recent years have seen companies being supported in the positioning of new developments in the retail sector, reports Dr. Thomas Lange, Network Manager of the Network for Food Economy of Saxony-Anhalt and Managing Director of the Agricultural Marketing Association of Saxony-Anhalt in Magdeburg. "Market reconnaissance trips have proven to be a worthwhile way of boosting exports, with visits to international trade shows and discussions with importers." The companies' power of innovation has been strengthened through collaborations with universities, especially Anhalt University of Applied Science. "We are bringing students into companies, providing topics for bachelors and masters dissertations, and including young people in the product development," explains Michael Heinemann. Continuous investments are also necessary in staff training. For this purpose, together with the Halle-Dessau Chamber of Commerce in the south of the federal state, the network has organised a Master Craftsman training programme which takes place at the weekends. Right now, however, Thomas Lange explains that the biggest challenge is attracting talented young employees: "Many of the apprenticeships in the sector are vacant." Despite the fall in the number of school leavers, however, the Klemme AG companies which are owned by ARYZTA AG began the apprenticeship year of 2015/2016 with a record number of 105 apprentices at the plants in Eisleben and Mansfeld. Taster internships and work experience placements are offered during the school holidays, and plant tours are organised for local schools. “Realising that you don't necessarily start off in your dream job is of considerable importance when you're making your initial career choices," explains Personnel Manager at Klemme, Cathleen Schlüter. The company will be attending the apprenticeships fair on 29th and 30th October in Sangerhausen again with its own exhibition stand. "We will be joined by some of our current apprentices, who will be telling those who visit our stand about how the apprenticeship at ARYZTA works and what makes our company different," highlights Training Manager Matthias Nolte. Among other personnel, the company provides training for specialists in food technology, mechatronics and storage logistics, industrial managers and IT experts in systems integration. A dual study programme is on offer in the field of mechatronics. Recently, the large-scale Klemme AG bakeries were conferred the "Top Training Company" hallmark by German Chamber of Commerce (IHK) for the second time. "We are one of the most attractive employers in Saxony-Anhalt. This hallmark will help to raise our profile throughout Germany," says Cathleen Schlüter. The involvement of ARYZTA has seen the qualifications available and the career opportunities expanding, with secondments at foreign locations complementing the internal offers. The company ARYZTA AG has over 60 production sites worldwide and is a leading manufacturer of frozen baked food, with a product range that encompasses breakfast rolls, croissants, sweet pastries, savoury snacks, cakes, and cookies. It currently has approximately 18,700 employees in Europe, north and south America, Asia, Australia and New Zealand, and generated a turnover of more than 4.8 billion Euros in 2014. In 2014, the turnover generated by the 103 companies with more than 50 employees in area of feed- and foodstuff manufacturing totalled 6.5 billion Euros with 18,605 employees (turnover generated abroad, 1.11 billion Euros). With a 16.5 share in the employees, and a 15.4 percent in turnover, the food industry is the strongest single branch in the manufacturing sector in Saxony-Anhalt. The areas with the highest turnover are butchering and meat processing with a turnover of 2.5 billion Euros and 4,390 employees, the baked food industry with a turnover of 0.89 billion Euros and 7,213 employees, and milk products manufacturers, with 0.78 billion Euros and 1,151 employees.